I Love To Dig! - I Love to Dig! Scholars have argued over those bones ever since Greek archaeologist Manolis Andronikos discovered the tomb in 1977-78. Scholars have argued over those bones ever since Greek archaeologist Manolis Andronikos discovered the tomb in 1977-78. He excavated a large mound — the Great Tumulus — at Vergina on the advice of the English classicist Nicholas Hammond. Analyzed by Antikas' team since 2009, the male and female bones have revealed peculiarities not previously seen or recorded. 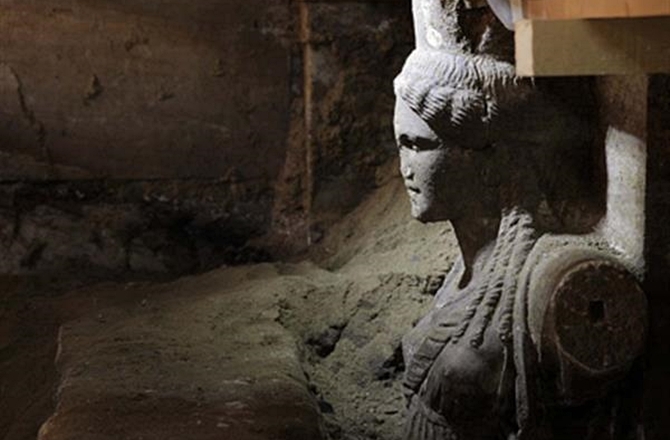 Tomb of Alexander may have been discovered! Alexandria. 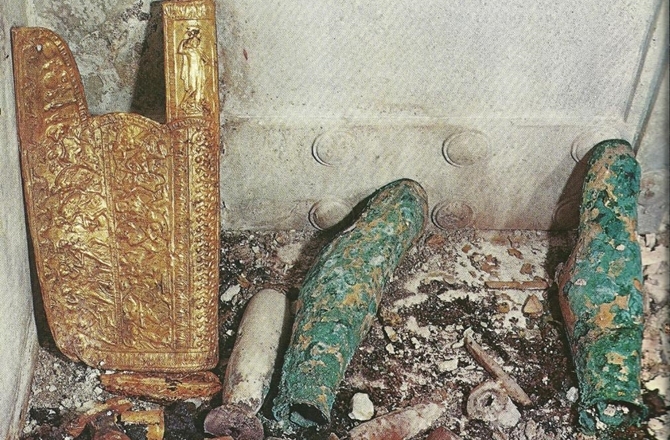 A team of archaeologists and historians from the Polish Center of Archaeology, that were conducting some research in the crypt of an ancient christian church, have revealed a mausoleum made of marble and gold that could well be the long lost tomb of Alexander III of Macedon, who went down in history as Alexander the Great. The site is situated in an area known as Kom el-Dikka in the heart of downtown Alexandria, only 60 meters away from Mosque of Nebi Daniel, where Arabic tradition maintained the tomb was to be found and where many excavations had already been conducted. A famous site of pilgrimage in Antiquity, the tomb is notably known to have been visited by many Roman emperors, including Julius Caesar and Gaius Octavius, better known as Augustus, who is said to have placed flowers on the tomb and a golden diadem upon Alexander’s mummified head. The last recorded visit to the tomb was made by the Roman emperor Caracalla in A.D. 215, less than a century before it disappears from Roman records. 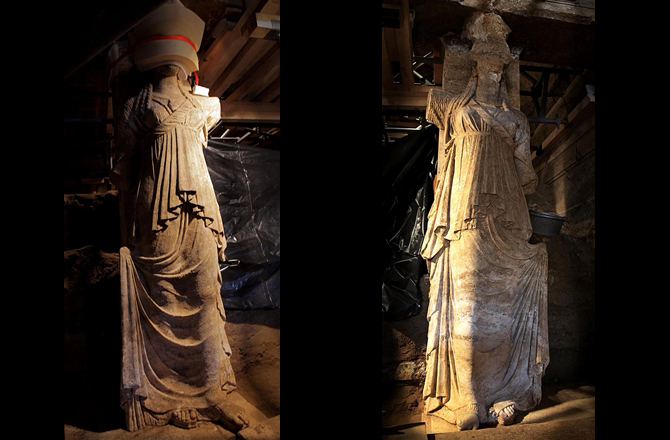 The large monument, apparently sealed off and hidden in the 3rd or 4th century AD, possibly to protect it from the christian repression and destruction of pagan sites after the change of official religion within the Roman Empire. The entire site is a testimony to the multicultural nature of Alexander’s empire, combining artistic and architectural influences from both Greek, Egyptian, Macedonian and Persian origins. The inscriptions, mostly in greek, but including also a few egyptian hieroglyphs, mention that the Mausoleum is dedicated to the “King of Kings, and Conqueror of the World, Alexander III”. It held a broken sarcophagus made of crystal glass, possibly damaged during the looting that took place during the political disturbances that ravaged Alexandria during the reign of Aurelian shortly after A.D. 270. It also held 37 bones, mostly broken or heavily damaged, presumably all from the same adult male. A carbon-dating analysis is already under way to determine the age of the bones, and a battery of other tests also await to determine if the bones could be those of the Macedonian king. Other than that, the site held only a small number of artefacts, mostly broken pottery, dating mostly from the Ptolemaic and Roman eras. The Egyptian Supreme Council for Antiquities had already officially recognized more than 140 unsuccessful searches for the site of Alexander’s third and final resting place, built by Ptolemy Philadelphus around 280 BC. Many astounding theories had been elaborated by various historians to explain the fact that the archeological excavations had come up empty-handed. Some historians had even evoked the possibility that his body could have been unintentionally stolen from Alexandria by a pair of Venetian merchants, taken to Venice, mistakenly renamed and venerated as St. Mark the Evangelist in Basilica di San Marco (Venice, Italy). The actual facts however, seem to have been a lot closer to what had been corroborated by many authors of Antiquity and the Middle Ages, such as Plutarch, Ibn ‘Abd al-Hakam, Al-Massoudi and Leo the African. In 321 BC, on its way back to Macedonia, the funerary cart with Alexander’s body was hijacked in Syria by one of his generals, Ptolemy I Soter. Ptolemy then diverted the body to Egypt where it was interred in Memphis, the center of Alexander’s government in Egypt. Then, in the late 4th or early 3rd century BC, Alexander’s body was transferred from Memphis to Alexandria, where it was reburied. By the fourth century A.D., the tomb’s location was no longer known, if one can trust the accounts of several of the early Church Fathers. However, creditable Arab commentators, including Ibn Abd al-Hakam (A.D. 871), Al-Massoudi (A.D. 944), and Leo the African (sixteenth century A.D.) all report having seen the tomb of Alexander, but none of them specified its exact location. This new discovery by the Polish Center could certainly be one the most important ever made in the country, despite the already immense wealth of archeological treasures it has yielded. The site itself is a masterpiece of architechture and craftsmanship, and containing many possible new details about the great king. Should the bones turn out to be those of Alexander, the importance of this incredible find would certainly skyrocket, making it one of the greatest in history of archeology, if not the greatest. Found in an archaeological dig in Bethsaida, this rare bronze coin tells of love, trade ties and globe-shaking jealousies. And what if Marc Antony had won the war? Great rulers come but a rare few leave a mark echoing down the millennia. Two such were Cleopatra and Marc Antony, who fleetingly placed Egypt at the center of the ancient world, only to unleash unrest and eventually war on the region. A few thousand years is a mere blink of an eye when it comes to the vital ties between this land and Egypt, as attested by a rare coin carrying historical weight far greater than its 7.59 grams, which depicts the notorious lovers – and which emerged last year from the ruins of a first-century house at Tel Bethsaida on the Sea of Galilee. Tel Bethsaida rises from the northern coast of the Sea of Galilee, but the coin was minted in another city by another sea – the Mediterranean port of Akko - today better known as Acre. The coin, made of bronze, is about the size of a quarter, being 21–23 millimeters in diameter (it is not perfectly round, at least not any more). Its date shows that it was minted in the last half of the year 35 or the first half of 34 BCE. Ptolemais is the Greek name for ancient Akko, which was founded in the 3rd century BCE and named after Ptolemy II Philadelphus. The name appears in the New Testament (Acts 21:7) as the home of an early Christian community that Paul the apostle visited: "And when we had finished our course from Tyre, we came to Ptolemais, and saluted the brethren, and abode with them one day." The coin was minted some two and a half centuries after the city was founded, a time when both Mark Antony and his bitter rival Octavian were in their prime and no one knew who would prevail, Arav says. Why depict them? The cities of the ancient Middle East had a habit of minting coins bearing the portraits of whoever was in power, says Dr. Donald T. Ariel, head of the Israel Antiquities Authority Coin Department. And Marc Antony was most definitely powerful in the year stamped on the coin. Prof. Rami Arav, director of the Bethsaida Excavations Project, suggests that the minting of the coin may have had to do with Marc Antony's victory over the Parthians, rulers of a land in what is now northeastern Iran and Armenia, in 35 BCE. He then granted Armenia to Cleopatra’s sons and gave Cyprus to her daughter Selene. Cleopatra also appears on coins from the same period, found in cities further north up the Lebanese coast, that were among gifts Marc Antony gave his consort. That same year Marc Antony, still deeply involved with Cleopatra, moved the capital of the empire from Rome to Alexandria, Egypt. 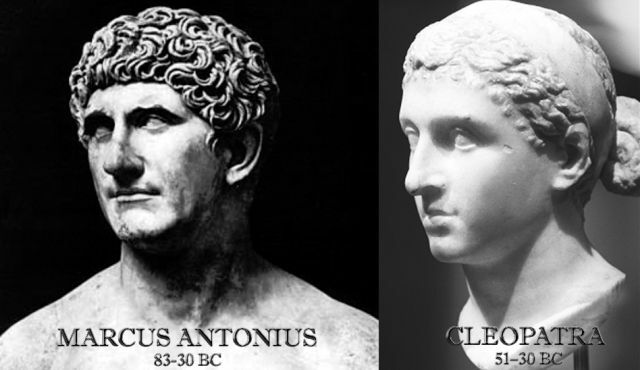 Had Antony not lost the battle of Actium in 31 BCE, there might have been a dramatic change in the history of the Western civilization, Arav says. But Antony did lose that battle, and 11 months later, he took his own life, dying in Cleopatra's arms in an immortal star-crossed lovers’ moment. Other coins from Akko have been found in Bethsaida, showing the trade connections between the port city, an international commercial hub at the time, and Bethsaida, a regional one, Arav points out. The "lovers' coin" recalls Bethsaida around the turn of the first millennium, when its main claim to fame was being the New Testament home of the apostles Peter, James and John. Bethsaida was where Jesus is believed to have healed a blind man (Mark 8:22-25) and fed the 5,000 (Luke 9:5-17). But much of the efforts of Arav’s team involve uncovering remains that go back a thousand years before that – to a time the city was the capital of the ancient, strategic kingdom of Geshur, the homeland of one of the wives of David’s youth, Maacah. Coins with the portraits of Antony and Cleopatra are extremely rare. Only six have been found anywhere in the world, says Ariel. But to him the coin recalls Cleopatra’s connection with a man who doesn't even appear on it - the man who, after Jesus, is perhaps the best-known figure of this land: Herod the Great. Cleopatra managed to persuade Marc Antony to wrest Herod’s priceless balsam plantations from him and hand them over to her. As a client king of Rome, there wasn’t much Herod could do about that (in fact, it is said Herod rented the plantations back from her and still turned a profit). However, Ariel notes, Herod, who was no stranger to romantic imbroglios, was able to resist the queen’s wiles - unlike Julius Caesar and Marc Antony - and hold on to the rest of his kingdom. In fact, Herod confessed to Augustus, the victor of the battle of Actium, that he had always counseled Marc Antony to kill Cleopatra, to put an end to the long civil war that tortured Rome after the assassination of Julius Caesar. "But hers was a restless mind. She never shook off an exchange with her father from years before. Martinez has been browsing through his library in 1990, looking for something to read. She picked up Shakespeare’s Antony and Cleopatra, which her father dismissed. Cleopatra was a mere political schemer, he said, not even deserving of a historical footnote. "Why do you speak of the queen like this?" she recalls. "How do you know? What are your sources?" Martinez vowed to find out for herself, a daunting task in a small Caribbean island in a pre-Internet world. " I read everything, Plato, Socrates, especially the Romans," she says, adding that she came to understand the axiom that history is written by the winners. "Of course, the Romans hated the Egyptians. They attacked her beauty — she was plain, but it does not matter. Then I looked for Egyptian sources, and they described a different person. They said she was the greatest of her dynasty. She ruled the most important country in the world. She was the most important woman on earth. She was a queen when she was 18 years old. I concluded that Cleopatra was a special woman. She spoke nine languages, wrote about the law and medicine. Every day I got more and more interested in this woman." But, being who she was, Martinez could not stop there. She devoured the Cleopatra story, trying to read past historical bias and understand the young queen as a woman and a mother. With this perspective, Cleopatra’s political maneuverings and personal choices came into sharper relief. Even the oft-told story of how Cleopatra first presented herself to Julius Caesar, rolled up in a rug, is viewed by Martinez as nothing less than a stroke of military and strategic genius. "Cleopatra was on the run, hiding in the desert and learned Caesar was in Alexandria," she said. "She needed to meet him, but how? She came up with a plan, arranging for a rug to be presented as a gift from her. Now, this was a Roman general. The most protected man. If she were caught, she would be dead in an instant. It was incredible. Imagine [sneaking] into Barack Obama’s office. I became an admirer of hers." I am an archaeologist and adventurer. I love dogs, food, wine, and books. Most of all, I love to dig.